If you are looking for a light and entertaining family movie, Jumanji: Welcome To The Jungle is for you. Thanks to its eminently likeable cast (both old and young), Jake Kasdan’s film is consistently funny as it romps along. In short, it is a lot of silly nonsense but a good time nonetheless. Jack Black steals the show with his brilliantly convincing portrayal of Professor Shelly Oberon. I also enjoyed Karen Gillian's performance (in a refreshing non-Nebula blue role). She is great as Ruby Roundhouse. Meanwhile, Kevin Hart and the charismatic and ever watchable Dwayne Johnson have great fun with their ‘against type’ characters. 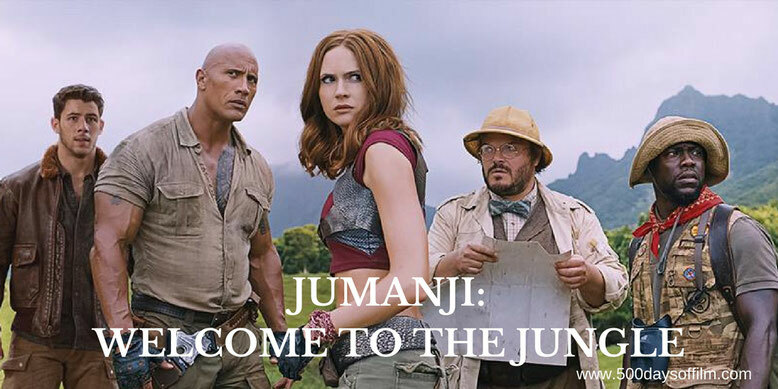 It seems churlish to nitpick Jumanji: Welcome To The Jungle. This is a film with no pretensions other than to offer us a couple of hours of escapist fun. However, I did find myself wishing that there was more depth to the game itself. Movies about computer games have had a pretty chequered past. However, Jumanji: Welcome To The Jungle’s game world felt intriguing - particularly as anything could happen. The film has the luxury of not being bound by the limits of reality. However, while the game is set up effectively (with some lovely gaming references), the movie does not exploit its concept to its full potential. The characters talk about having to complete levels and yet strategy is sacrificed in favour of more runny and jumpy action. Despite this, I had a good time watching Jumanji: Welcome To The Jungle. It is harmless popcorn fun with a rather sweet centre and, let's face it, we all need some of that every once in a while. If you have, what did you think of this film? Let me know in the comments section below of via Facebook or Twitter (@500DaysOfFilm).